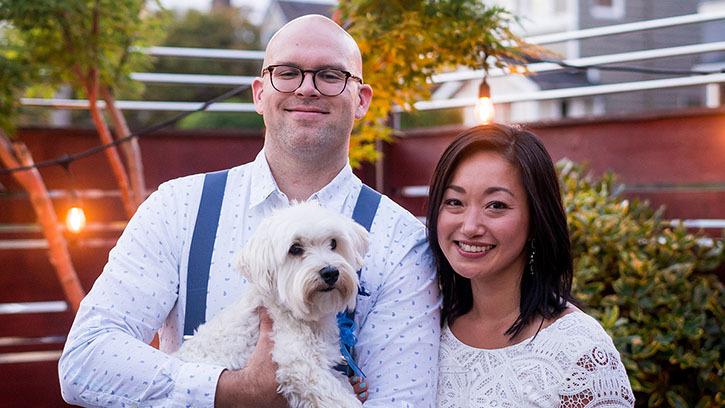 Seattle Symphony First Violin Mae Lin loves going on adventures with her husband, Brett, and dog, Scotch. Now, three and a half years later, Mae, Brett and Scotch live together in Seattle’s Green Lake neighborhood. Mae and Brett celebrated their wedding this past summer. “Now we like to go on adventures together, looking for the best donuts in town or taking Scotch to the arboretum,” smiles Mae. Eleven years after winning the audition, Mae still looks forward to every concert, often looking for familiar faces in the audience each week. Through the caring support of our donor family, the Seattle Symphony is able to attract and retain world-class musicians like Mae. Join the community of supporters who make our music possible with your donation today!